Welcome, dear reader. Speaking here is Dr. Rosalie Thompson, journalist and registered physician. In the last few months, I excavated the Neovian Printing Press and unveiled a conspiracy that might redefine all Neopians’ conception of reality. Follow me on this journey of enlightenment. 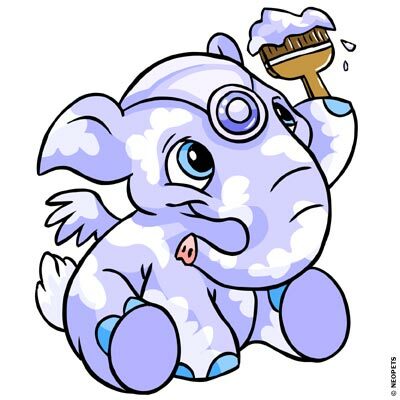 If you’ve been a citizen of Neopia for a long enough time, it’s possible that you may have painted your Neopet using one of those infamous paintbrushes. Paintbrushes are highly sought-for items that retail for a large amount of Neopoints due to their apparent magical properties that allow a Neopian to customize their Neopet according to their tastes. But how do paintbrushes really work? How have they appeared into Neopia? Those are answers that will be answered today. Beware, disturbing content ahead. It all started when I accompanied a good Aisha friend to the Rainbow Pool, in Neopia Central. We have traveled far and long in order to give her those Faerie wings she always wanted. When we got there, I was stopped near the entrance by one of Naia the Fountain Faerie’s assistants. I expressed my desire to be there when the transformation occurs. You see, as a physician, I have always been quite fascinated by the process of paintbrush morphing. However, I was denied the right to see the transformation. Four long hours I waited (spending most of that time at the Magical Bookshop, but I digress). My friend came back with her beautiful pink wings and… no memory of the transformation. This was my first clue that something strange was going on. I came back to Neovia, minding my own business for a good two months or so, until one of my patients expressed the commonplace wish to get painted. Zombie, of all things. This was a peculiar desire, but to each their own is what my mother always said. However, I saw it as a golden opportunity to investigate the mystery of the paintbrushes. I wondered, is the Rainbow Fountain necessary for the transformation? What component makes it a critical part of the process? Isn’t it, after all, just water? So, we traveled. Once again, I was stopped at the entrance. Only prospective paintbrushed Neopets are allowed in. But this time, I was determined to see the event. I found the back entrance and lockpicked my way in (no need to be judgmental! Trespassing is not illegal if it’s done for the sake of science!). I peeked in and saw my patient as the Fountain Faerie applied the paint (salve?) all over his body. He then plunged into the fountain and waited. What followed was a gruesome sight that seemed like it came straight from the Haunted Woods. The first thing that naturally happened was his death (zombies are, after all, undead creatures). Over a few hours, the skin and fur knit its own clothing and stitches, and putrefaction took place. My patient was rendered blind. However, I must say, the whole process seemed quite painless as far as I could tell. It was quite fascinating and motivated me to conduct my own experiments by my own (of course, with my patients’ consent). The first thing I did was to compare notes on the behaviour of Neopets before and after a paintbrush transformation. Was there a difference? Turns out that yes, the nature (colour) of the transformation determined the change in individual personality. My Faerie Aisha friend became more carefree yet regal. My Zombie Acara patient… started to have strange cravings. This led me to believe that the changes occurred on a molecular level, changing the arrangement of neurons and perhaps even the DNA itself. Additionally, I took samples of Rainbow Fountain water. Neovia’s technology isn’t yet at Kreludor level, to say the least, and thus it was difficult to analyze its precise composition. The only way to achieve it, is to test it on live subjects. But in order to see what is caused by the paint coating the brush and what is caused by Rainbow Fountain water, I must apply them separately. A Lupe patient of mine came into my clinic, wanting the Woodland treatment. I divulged my intention to experiment the paintbrush process and he accepted to be part of the trial. And so, I applied the paint carefully, noting every change in symptoms. Soon after I started, the change started to take place. The Lupe screamed in agony. In my panic, I did not know what to do. But the truth had to be known. I took a skin sample and observed it under the microscope. To my astonishment, the animal cells died individually and turned into plant cells! I then tried to apply the Rainbow Fountain water on my patient, making him drink some of it as well. He shortly fell into a peaceful slumber. Fascinating! It seems the water is in fact an anesthetic! But how can the Rainbow Faerie accept such a morbid treatment of Neopets, all for the sake of aesthetics? Certainly, she must know the effects of the transformation. And so, I did my research. I hit the books. What I discovered is that paintbrushes coincidentally came into Neopia at the same time as transmogrification potions. It’s impossible to tell whether Dr. Frank Sloth is involved in the creation of paintbrushes, and the extent of the Fountain Faerie’s involvement, but it could be a conspiracy of massive proportions. Maybe even Fyora is in on it! If anyone knows a way to contact Dr. Sloth, please report it in the address provided by the Neopian Times. I have tried to question the Fountain Faerie without much success. But I WILL uncover the truth! Addendum: Xweetok doctor Rosalie Thompson was incarcerated into the psychiatric unit of the Neopian Hospital as of two weeks ago. All content written by her into the Neopian Times is rendered disreputable. The Neopian Law Enforcement Team urges the reader to burn all copies of the issue that contains the article entitled “The Paintbrush Conspiracy”. Thank you and have a good day.